After a couple of late starts to the winter seasons across European resorts in recent years, we’ve been thinking long and hard about what we can offer to make sure you have an amazing holiday experience staying with us in Les Gets, France. We can’t guarantee perfect powder, blue sky, sunshine and cold temperatures every day, but we can help to make your winter holiday as perfect as mother nature will allow. 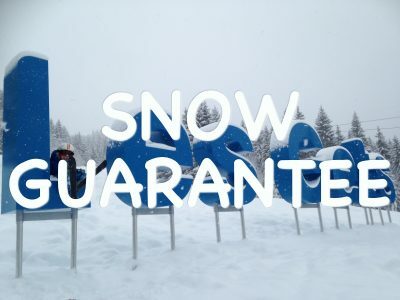 That’s why this year we’ve put together our very own snow guarantee. The question you’ll be asking is how can we guarantee snow? Well the honest answer to that is we can’t. What we can say is that over the last decade of running our ski holiday business, there hasn’t been a single day when our guests haven’t been able to ski. We know the resort like the back of our hand and we have links to all the updated information regarding lift opening and closing status’ across the Portes du Soleil. The biggest problem we have is if links between the ski areas are not open and working out how to get you from the Chalet to the snow. Now we have our snow guarantee in place we will ensure that you get to the snow each day without any additional costs. For the first three weeks of the 2017 season we will offer free transport from the Chalet to various links around the Portes du Soleil. These include the Chavannes Express Telecabin, the Mont Chery Telecabin, the Super Morzine Telecabin, the Pleney telecabin, the Ardent Telecabin linking to Chatel and the Prodain telecabin linking to Avoriaz. Free transfers to the snow will be offered through a scheduled timetable throughout the day. Should you just go to a high altitude resort? Answer = NO. The problem for the last couple of winters with the late snowfall has not been the altitude, the problem has been with the lack of precipitation falling from the sky. Les Gets resort sits at 1172 metres above sea level. Some would class this as a low level resort, but what you must take into account is the geographic location of Les Gets and the Portes du Soleil. It sits right between the largest lake in Europe (Lac Leman) and the highest mountain in Europe (Mont Blanc). 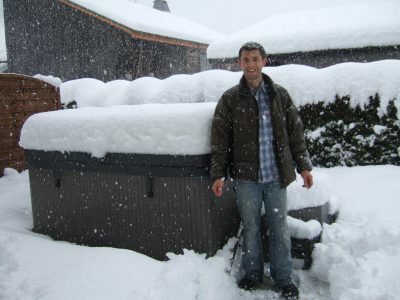 This creates a fantastic microclimate which produces some amazing snow falls each season. Also take into account that because Les Gets has a lower altitude than say Val Thorens in The Three Valleys, the ground is covered in grass meadows and not big boulders of rock. This means that with the smallest amount of snowfall, the piste bashers can get to work grooming the slopes. The tree covered mountains also protect the pistes when the wind blows and help maintain good snow cover down the whole piste throughout the season. Les Gets and the Portes du Soleil have invested heavily in snow making equipment over recent years. 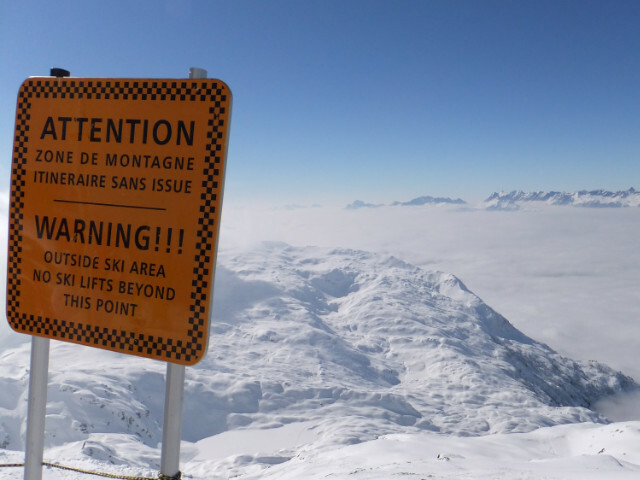 The understanding of what makes a good snow base and how best to manage the snowfall has all played a vital role in producing fantastic ski pistes all through the season. What happens if there’s no snow? If there are no lifts open (drag lifts/chairlifts/gondolas) in Les Gets, Morzine or Avoriaz, your booking can be curtailed and you will receive a credit note for the total remaining accommodation value of your holiday booking, excluding flights, airport transfers, holiday insurance, ski passes, equipment hire, lessons, guides, or any other costs you have incurred. The credit note can be used to book any future holiday with RushAdventures. 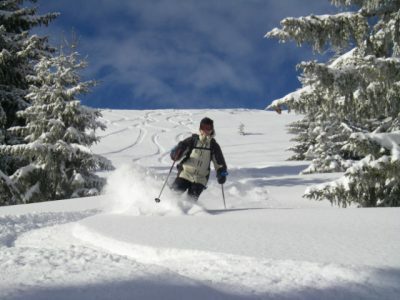 * Remember there are loads of other activities on offer in Les Gets and throughout the Portes du Soleil in winter. Les Gets have been very forward thinking and proactive in past years, putting on extra activities, events and shows to make sure you have a wonderful holiday. 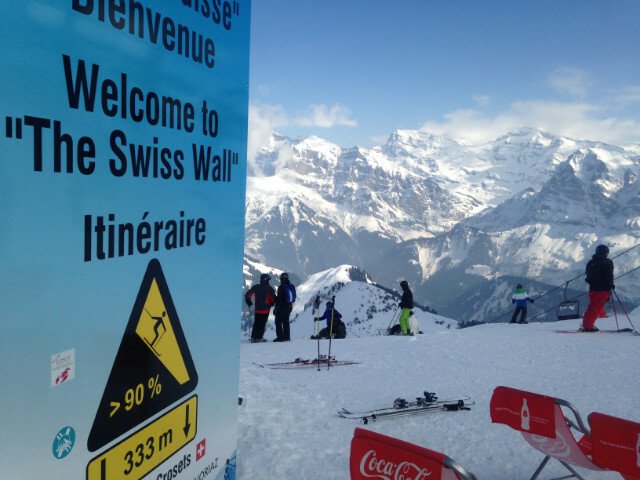 Come and experience some great early season skiing on quiet slopes in the Portes du Soleil. The Les Gets ski lifts can open from as early as late November depending on snow conditions. Avoriaz officially opens on 15th December 2017 with a great choice of ski pistes for all levels and abilities. Avoriaz hosts the Rock On Snowboard Tour where you can test some of the latest skis and snowboards for free and watch live DJs on the slopes. There’s even a Burton learn to Snowboard area for kids from 2 years old! Head to the mountains this Christmas and spend a magical week on the snow skiing with your family. Les Gets is a charming resort with a very friendly and welcoming character. Everyone in resort wants to help ensure you have a fantastic Christmas experience. Skiing, snowboarding and tobogganing are great activities for all the family and available to do every day including Christmas Day. Les Gets also has a special Christmas programme of events and entertainment on and off the snow to keep all your family entertained this Christmas. Escape the UK and come to the ski slopes of Les Gets to celebrate your New Year Holiday with family and friends. 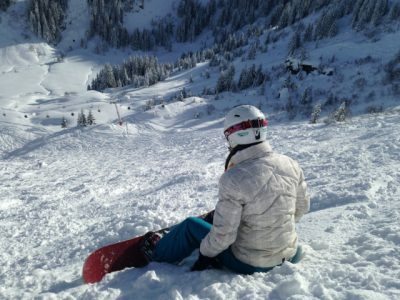 Take this opportunity whilst businesses and schools are closed to enjoy some fantastic skiing in the Portes du Soleil. Every New Years Eve we offer a special 6 course evening dinner to celebrate this wonderful time of year before heading out to the centre of Les Gets where you’ll find live music, fireworks and a great atmosphere in the bars and clubs. Terms and conditions apply. Our snow guarantee is only applicable to bookings made at Chalet Aventure and Chalet Fram between the period Saturday 16th December 2017 to Saturday 6th January 2018. Our snow guarantee is only valid for bookings made directly with RushAdventures and does not apply to any bookings made through other affiliated sites. Our free transfer service to the snow runs on a scheduled basis and you are expected to be at the pickup points on time ready for collection. If you miss your departure/pickup time you will be expected to make your own arrangements and the cost will be covered by you. If there are no lifts open (drag lifts/chairlifts/gondolas) in Les Gets, Morzine or Avoriaz due to lack of snow, your booking can be curtailed and you will receive a credit note for the total remaining accommodation value of your holiday booking, excluding flights, airport transfers, holiday insurance, ski passes, equipment hire, lessons, guides, or any other costs you have incurred. *The credit note can be used to book any future holiday with RushAdventures subject to availability. The credit is valid for five years maximum. We reserve the right to change or withdraw this offer at anytime.